Hello, We have been schlepping a coffee set all around the world for the past 40 odd years! Thinking about it they have been quite odd! It was given to me by my mother-in-law, we have never used it, so it's been wrapped up in a box for all that time. I Just came across it again when sorting through loads of boxes before moving yet again. I have searched all through loads of marks and have come to the conclusion that it must be a 'made-up' mark for the masses, just hoping that someone somewhere can identify it and then perhaps I can feel justified in passing it on to someone, I can't even seem to identify the letters MTK, maybe I'm just being dense. It appears to be hand painted and not just a transfer. I have seen genuine hand painting at the Lomonosov factory in St Petersburg, Russia before it was modernised and have great respect for all those workers. 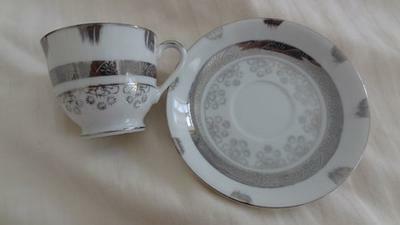 Unfortunately I now have loads of Lomonosov china as well, it was a mistake to go to the factory, where the prices were so low, mind you this was way back in the early 90's, so more schlepping I'm afraid. Although we do use that china, well most of it anyway, and then I inherited more when my Mum passed away, didn't have the heart to get rid of it. Gosh I didn't realise 600 words would be so hard to write. Back to the original coffee set then, it also has a coffee pot, sugar bowl and milk/creamer jug, don't know how it has managed to survive all these moves without getting chipped, must be down to the expert packaging, so that's about it, hope someone will recognise the mark or the pattern for me. You are a star - great little article. And what is an interesting first for this site. (Sorry it took me a while to get around to this entry but I lost a batch and have only just found them).. Anyway, I think I might have the answer, through someone more knowledgeable than me about post-war Japanese fine china need to to help out a bit. 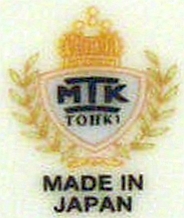 Okay, some cunning google-fu led me to a mark which said MTK TOHKI JAPAN. 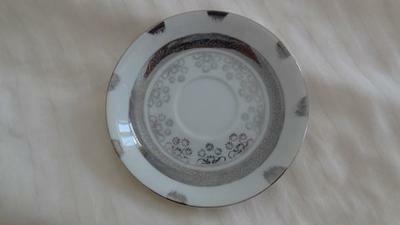 Then I saw some people were associating MTK TOHKI with MITAKE FINE CHINA JAPAN which I believe to be one of the hundreds of labels used for distribution of fine china in the US in the post war period. I don't know who the brand belonged to or who made the wares. I don't know if MTKTOHKI is one and the same as MITAKE - like a more English version of the same thing, but if it is, hopefully someone can confirm. Finally someone has something with the same mark! 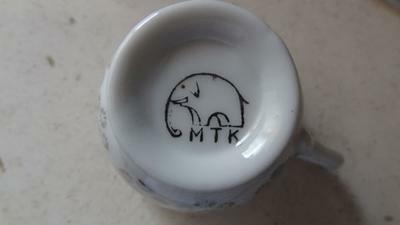 I have a tea or coffee pot with the elephant and MTK. I don't know exectley where mine is from, nut I inharreted from my grandfather and he came from India to Surinam ( South America). I don't know is hè brought it from there. I'm still searching for more information About this mark. Hey I am from Trinidad and an old friend of mine gave me some ceremics with the same logo. She had these a very long time, she is like 93 years. I too want info on this so bad. I have a couple of small cups with the same mark, some broke so I was hopping to find some info to replace them. I got them form my grandmother just as well. I am in Ecuador, far from any African trace. Suddenly it interests me how they got this far.